I really wanted to like this recipe. They looked great, smelled good, but when I ate them, I wanted them to taste like a potato pancake. The texture was just a bit too mushy for me. I think part of the problem is we have just eaten too much zucchini this week. I'm sure others would love these. Combine all ingredients in a bowl until well incorporated, making sure there is no loose flour in the bottom. 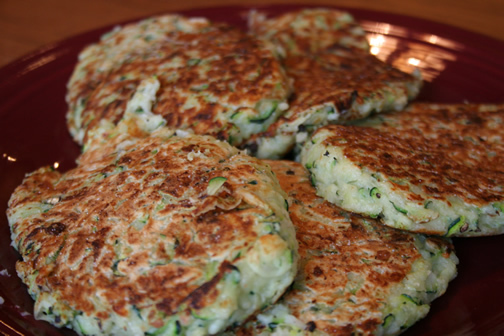 Form into patties and cook in a pan on each side, about 7 minutes.